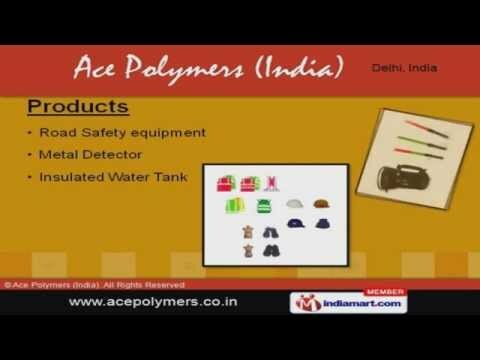 Welcome to Ace Polymers (India)Manufacturer & Distributor of varied range of Traffic Safety EquipmentThe company was established in 2006. Hi Tech manufacturing environment andadherence to international quality standards make us unique. Customization, timely delivery and qualitative product range help us to achieve totalcustomer satisfaction. Cinema Halls, Shopping malls, Traffic management & Power works Department aresome of our application areas. Our Quality Testing parameters include Strength, Stiffness, Color fading, Finishing, Antistatic properties and Dimensional Accuracy. We offer a diverse range of Road Safety Equipment, Metal Detectors and InsulatedWater Tanks. Safety Signageâs, Road Studs, Safety Vests and Helmets and Convex Mirrors areavailable under Road Safety Equipments. We also provide Speed Bumps and Spring Posts under Safety products that areextremely reliable. Lastly, we supply Safety Barriers and Traffic Cones.